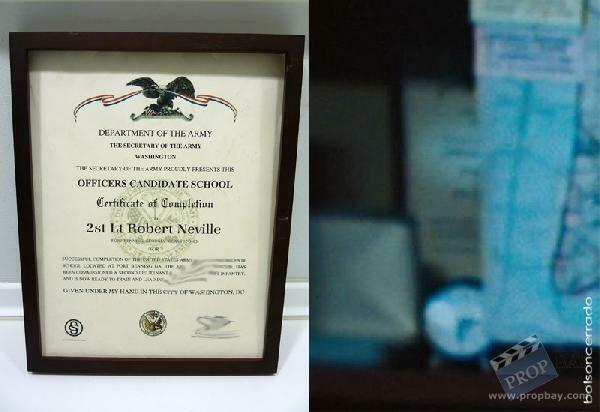 This is an Officers Candidate School Degree Certificate granted to Dr. Robert Neville (Will Smith) used in the 2008 sci-fi film I Am Legend. The certificate was used to decorate Dr. Robert Neville's (Will Smith) office. It can be easily screen seen thanks to the pattern of the text and the subtle image of the ribbon on top, as only a dozen of certificates of all kind (medical mainly but some related to the Army too) were made. Moreover, the certificate is from the Officers Candidate School, and has Neville listed as "2st. Lt. Robert Neville". The typo makes it even more rare! Comes framed in a real wood frame (intentional blurring on some parts has been applied to avoid faithful replication). Image 2: Will Smith as Dr. Robert Neville documenting his findings while on his office. You can see this exact degree in the back of the map. Added: 12-11-2011 - Viewed: 2067 times.